Update – May 2018: We’ve had reports that deliveries of these mics are taking 3 weeks or more, and that Giant Squid can be a little slow in communicating. If you’re urgently looking for a lavalier mic, there are some other options in our Best Lavalier Mics Roundup! 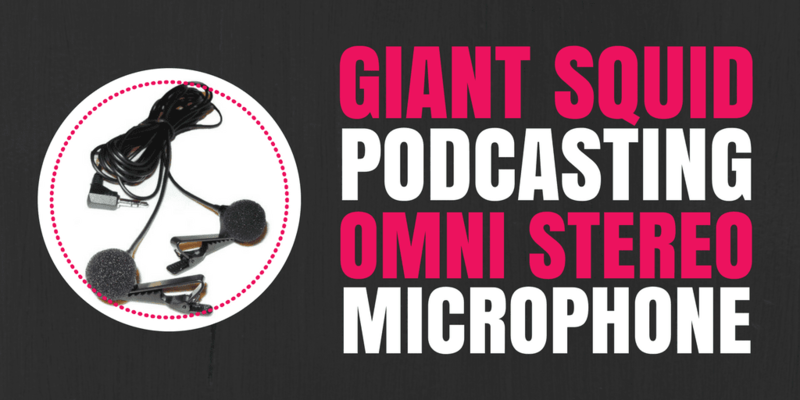 Giant Squid’s Podcasting Omni Stereo Microphone is a twin lavalier mic, which is perfect for recording interviews or co-hosted podcast episodes locally. Lavalier microphones are great for podcasting on-location or if you often record in different places, as and when you can. Pin it onto your clothing, plug it into your recording device, and away you go. They’re portable, unobtrusive, and take away that feeling of ‘talking into a mic’, all of which can lead to more natural conversations. Recently, we put together a roundup of our favourite lavalier microphones for podcasting. However, the catch with lavs is that they’re almost always solo mics – they often require a splitter or adapter in order for two to function at the same time. You should never use a single lav mic between two or more people, so a twin mic is an essential piece of kit if you’re recording a co-hosted or interview show. This design from the Giant Squid Audio Lab takes splitters and adapters out of the equation. It feeds two lavalier mics into one single 3.5mm plug (a standard headphone jack), so you don’t need to carry around two sets of lavs plus a splitter or adapter to hook them up. These mics have a unique touch to them, too. The man behind Giant Squid, Darren Nemeth, actually solders the plugs on himself! This ‘hand-crafted’ approach obviously means that availability is limited, and instead of finding these mics on Amazon they can only be purchased directly through the Giant Squid website. The mics themselves are omnidirectional condensers, which feed into one single plug via two lengths of six-foot cable. An optional extra is a gold-plated 3.5mm plug – the Neutrik NTP3RC-B. This is a right-angled plug, so it is much less likely to crack, split, or bend in your pocket or bag. The cables themselves are described as being rugged and flexible, with ‘a long flex life and high interference and noise immunity’. The mics have a low signal-to-noise ratio (62dB) and pin to your clothing with a robust, removable alligator clip. You can plug the mics into any computer or recorder with a 3.5mm input port. With a computer, the sound quality will depend on the quality of your sound card. With a recorder, you may need to have ‘plug-in power’ selected to operate the mics. I tested them successfully on both the Zoom H4 and H5 models. All the microphone’s technical info and specifications are available here. The first sound sample is a raw recording, which is in stereo form, and has had no processing applied to it. The second sound sample has been mixed down into a mono track and set to the appropriate podcasting loudness standard. The mics cost $75, plus an extra $6 if you choose to add on the gold right-angled plug. They are only available for purchase directly from Giant Squid. Shipping costs $6 within the USA, and $9 to the UK and worldwide. These mics come with a 12 month warranty. This setup is as close as you’ll get to recording two participants on their own tracks, using a single 3.5mm input device. The recording is a stereo track, rather than two independent channels, but you can split this into two mono tracks in post-production if need be. This gives you the option to alter the volume on one side, independently. Both tracks will still pick up the sound of both participants though, just at varying levels. They are omnidirectional mics in close proximity to each other so this is unavoidable. If you want to record completely independent tracks using lav mics and a recorder, with individual gain control during the recording process, then a setup like two ATR3350s into the Zoom H5 might be worth looking at. But again, bleed-through is pretty inevitable with any such setup, and usually won’t cause audio problems anyway. If you want to keep things simple, as well as cheaper, then the Podcasting Omni Stereo Microphone is an excellent option. It has great build and sound quality, plus it’s also extremely convenient and easy to use. It’s definitely a piece of kit we’ll be keeping handy for on-location interviews in the future. Are you still looking for a particular piece of podcasting gear? Check out all the equipment we’ve reviewed so far, at-a-glance, in our podcast equipment directory. Will this work on a zoom H1?